Over the last 20 years or so, we have gained vast experience in all types of roofing; working on both large and small sites. Azza's Roofing Services specialises in residential roofing and we are also available to carry out commercial work. We are pleased to provide a personal service that can sometimes be lost in bigger organisations. When you call us, we will provide you with a free, no obligation quotation after discussing the required roofing work in detail. The price we quote is the price you pay - there are no hidden extras or nasty surprises. 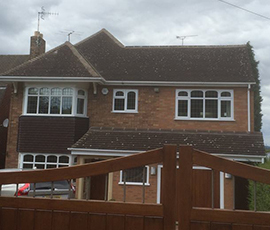 We are specialists in the relatively new area of 'dry fix' roofing including, verge capping, ridge and valley systems. To find out more about the benefits of this type of fix, please give us a call.